The first part speaks onthe present strategic situation in Syria and the role that the Race for Raqqa will have in determining the country’s post-Daesh future. Next, the article details the political posturing that will play out after the world’s most notorious terrorist group is defeated and how Syria could thenceforth become divided into the two competing electoral blocs of “federalist” and unitary supporters in the run-up to the forthcoming elections. Finally, the last part warns about the risk of an intra-patriot split between the unitary-supporting Ba’ath Party and Syrian Social Nationalist Party (SSNP), and how the SSNP could suddenly become the most influential party in all of Syria, especially if it defected to the “federalists”. Out of all the groups in the National Progressive Front, the one most likely to siphon off votes from the Ba’ath Party is the Syrian Social Nationalist Party (SSNP). 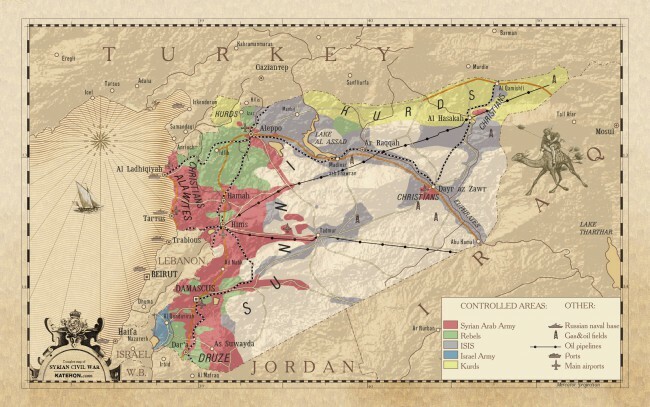 This Lebanese-founded organization has a very rich history and works towards the formal recreation of “Greater Syria”, which they describe in detail on their website as including most of the Fertile Crescent, Cyprus and parts of Turkey, Egypt, and Iran. Also called “Natural Syria”, one SSNP-affiliated author wrote that the Kurdish-inhabited areas of southeastern and southern Turkey fall under its domain as well, arguing that they historically formed a part of Syrian civilization that could be reestablished via the “golden opportunity” that “federalization” presents. The unofficial thinking goes that the SSNP – and as they see it, all of Syria (both present and “Greater”) – would unequivocally benefit through “federalization” because it would produce a mechanism through which the Turkish Kurds could then leave Ankara and join Damascus, somehow assuming that their wild pro-“independence” sentiments could be tempered and that all of these complicated interlocking processes could be achieved peacefully. Of course, the US would never allow its Turkish NATO ally to be dismembered on behalf of “Greater Syria” (though it might countenance this in favor of a unipolar-aligned independent “Kurdistan”) and it’s actually Syria itself which would likely be inadvertently dismembered in a boomerang fashion through its “federal” facilitation of “Greater Kurdistan”, but nonetheless, SSNP supporters are the most likely members of the National Progressive Front to be attracted to this dangerous and reactionary idea. The War on Syria is on the cusp of entering a new stage, with the US and its on-the-ground Kurdish-majority allies gearing up for a campaign to retake Raqqa, if CENTCOM head General Joseph Votel’s secret (and illegal) visit to northern Syria was any indication. The immediate post-war environment will be shaped by the “federal” and unitary forces jostling among themselves for political positioning in the run-up to the forthcoming elections and constitutional redrafting mandated by UNSC Res. 2254. Scheduled to take place before the end of June 2017, there’s a little over one year left before all the pieces fall into place and the latest chapter of the War on Syria is politically brought a close (although possibly not finished in full). The US and its allies have signaled that they do not intend to legally dismember Syria, but that they are more than willing to go through “democratic” motions in de-facto splitting it up until a collection of “federalized” identity statelets instead. Everything will come down to the upcoming elections when the “federal” and unitary supporters dramatically face off in epically determining Syria’s domestic political future for the coming years, and it’s more important than ever that the Ba’ath Party gets as much political support as it can in staving off the Kurdish-Salafist (and potentially -diaspora) pro-“federalization” coalition. Why Are The Kurds Saying That Chechens Are “Genuinely Native” To Syria”?